In our last couple of posts, we studied devices that people used to protect key parts of flintlock weapons from being exposed to wet weather, namely tompions and cows knees. Today, we will study another device that had its origins in Europe, but became very popular in the United States. Pommel Bag from the 1870s. Click on the image to enlarge. In the early 1800s, as settlers gradually started moving westward in the United States, many frontiersmen mounted on horseback, carried large bore pistols for protection. As the technology for repeating weapons was somewhat primitive, these were mostly single-shot models and therefore, each person would carry two or more pistols. At that time, black powder was still the propellant used for firearms, but it does not burn properly when wet. Therefore, it was necessary to find some way to keep firearms functional, even in bad weather conditions. Of course, it is possible to carry a pistol within a person's clothing to protect it from bad weather, but the problem is that when the weather is cold or wet, people wear multiple layers of clothing to stay warm, which makes the pistol harder to access. One way around this was to put the pistol in a container, attached to the saddle on the horse. The pommel bag (such as the example above) had a separate compartment designed to hold a firearm, and the cover flap on top kept the rain and snow away. 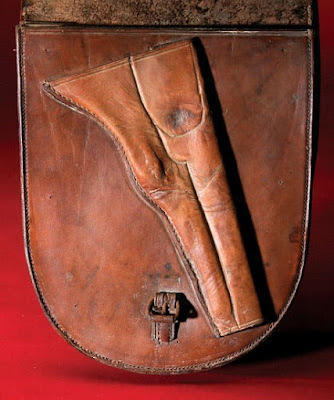 Pommel bags were typically mounted across the front of the saddle and attached to the saddle pommel (which is why they are called pommel bags). This makes it easy for a person to reach into a pommel bag, even when riding the horse. To access the firearm, the user merely had to lift the cover flap to get to it. The pommel bag often carried some additional gear for the pistol, such as extra cartridges, bullet molds, cleaning supplies etc. When revolver models such as the Walker Colt revolver and the Colt Dragoon revolver came to the market, they were heavy weapons that were impractical to carry on a person, therefore pommel holsters were usually the preferred way of carrying them. The US military even issued holsters for cavalry in the 1850s, designed to carry these heavy revolvers. The above image shows a pair of pommel holsters issued by the US Army around 1850. These were made to hold a pair of Colt Dragoon revolvers. Pistol buckets like those for the Dragoon are an ancient concept; we have a pair from the English Civil War. Yes sir, they are an ancient concept, as you say. That's why I mentioned that the concept really originated in Europe at the beginning of the post :). One of the best sources for viewing American holsters of all descriptions is Rattenbury's _Packing Iron_. Anyone interested in pommel bags or other methods of handgun carry could do far worse than to beg, buy, or borrow a copy of that book.